Union Square-Financial District is an area of Downtown San Francisco, bound by Market Street to the southeast, the San Francisco Bay to the east, Mason Street to the west, and Bush Street (between Mason and Kearny) and Washington Street (between Kearny and the bay) to the north. Surrounded by upscale hotels, Union Square is one of the largest shopping areas in the U.S. and is home to some of the nation's finest department stores, malls and specialty stores. 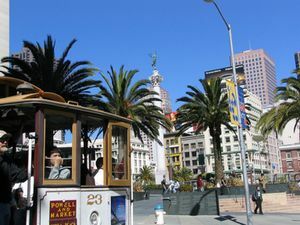 As if that wasn't enough, it also boasts many fine art galleries, some of the best restaurants in the city, and it also serves as San Francisco's main theater district, featuring many Broadway and off-Broadway shows. The city earmarked the area as a park in 1850, and its name was derived from the many lively, pro-Union Civil War demonstrations that were held there. The square itself, a public plaza, which is bordered by Post, Stockton, Geary, and Powell streets, got a major refurbishment in 2002 when most of its grass was paved over with granite stone. Built in 1903, the monument dedicated to the Goddess Victory still remains at the heart of the square. Today, people use the square mostly as a space to relax and soak up a bit of sun, and to wallow in the atmosphere created by the surrounding cable cars, hotels and shoppers. The Financial District is among the top financial centers in the United States and its many skyscrapers add a very impressive skyline to the city. 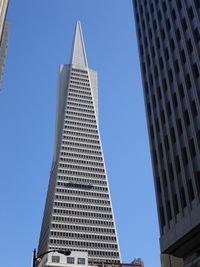 It is home to the headquarters of the 12th District of the United States Federal Reserve, as well as the iconic Transamerica Pyramid building. It also houses the corporate headquarters of many financial giants such as Visa, Wells Fargo Bank, Mckeeson Corporation and Charles Schwab Corporation. Despite the fact that the area was almost completely destroyed by the 1906 earthquake and fire, many of its original skyscrapers have survived. Today the architecture reflects a mix of both contemporary as well as more historic buildings such as the Merchant and Exchange building, the Bank of America building and the Russ building. There are also plenty of shopping opportunities in the area with centers such as the Embarcadero Center, the Ferry Building, and the Rincon Center. It begins at Montgomery, which was once known as the "Wall Street of the West," and ends at the Embarcadero. On-street parking is all but non-existent. Parking garages, while plentiful, can be expensive. Major parking garages for the Union Square area can be found at the NE corner of Sutter and Stockton, between Ellis and O'Farrell between Stockton and Powell, on Sutter between Kearny and Grant, and under Union Square. Several ferry companies operate service from around the bay to the Ferry Building on the waterfront. Extensive public transit is offered through the neighborhood, provided either by the regional BART  system or the city-wide MUNI  system, which encompasses the MUNI Metro, buses, cable cars, and the F-Line streetcar. BART and all of the MUNI Metro lines (J, K, L, M, N and T) run under Market Street with three stations serving this part of downtown: the Embarcadero, Montgomery Street and Powell Street. The Powell Street stop is just a few blocks down Powell from Union Square. The Powell-Hyde and Powell-Mason cable car lines run from Powell and Market past Union Square to Fisherman's Wharf. From the Embarcadero station you can catch the California cable car line. The F Streetcar Line runs along Market Street and up the Embarcadero to Fisherman's Wharf. There are several streetcar stops along Market Street. Numerous MUNI bus lines run through the area as well, such as the 38-Geary which runs past Union Square and the 1-California which runs through the Financial District past the Embarcadero Center. The #10, #30 and #45 lines run north-south through the district, connecting to Chinatown, North Beach, and Fisherman's Wharf to the north. Please note that along Stocton Street between Geary and Market is temporally closed due to construction of the new T-Line that will head into Chinatown in the future. 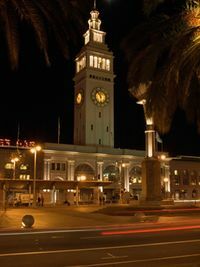 From Fisherman's Wharf, take a 25 minute walk down the Emabarcadero, which will take you all the way down to the Ferry Building, at the edge of the Financial District. From west of the area, it is also easily accessible by getting first to Market Street and then walking eastbound. The purpose of Union Square is shopping. Most upscale national chains can be found in the neighborhood, including Macy's western flagship store on the south side of the square, Neiman Marcus on the southeast corner, Saks on the north side, and Nordstrom two blocks south, on Market opposite the cable car turnaround. 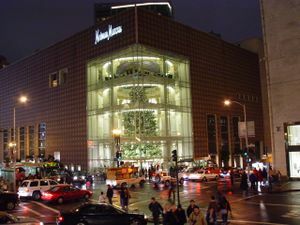 Other chains include Victoria's Secret, Borders, Harry & David, Sur La Table, a four-level Ross, a four-level Loehmann's, one of the rare H&M stores in the U.S., Forever 21 in a restored bank, Armani, Crate and Barrel, and numerous upscale stores at San Francisco Shopping Center. More interesting are the stores that can't be found in every suburban mall. There are numerous art galleries and a fascinating selection of local or unusual businesses. The Financial District also has some decent shopping centers to choose from. Though Union Square appears to be awash in cafes, it's one of the more difficult neighborhoods for good eating. Dining selections are crowded and geared toward the tourist market, though there are a few iconic restaurants that have must-see status just from their fame and age. It's also a center of high-end hotel dining. However, a short side trip west on O'Farrell or Geary to the Tenderloin for bargain Indian or Vietnamese food, a quick walk up Grant to Chinatown or (further) to North Beach may be worthwhile alternatives to fast food, long waits, or $200 a plate meals. In the Financial District there are various restaurants catering to those who work in the surrounding buildings although many close at the end of the business day and offer few dinner choices. Without a doubt, this is the primary hotel district for San Francisco. While most all of the main hotels are technically in the neighboring Tenderloin district (although they'll vehemently deny it) their proximity to Union Square and public transportation is hard to beat. The range varies greatly from large, international chains to smaller boutiques. 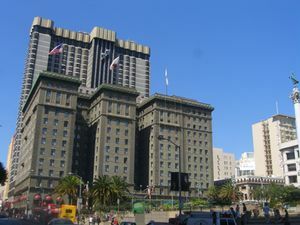 Note that San Francisco is a popular destination for conferences and conventions, and prices in the international chain hotels can become very inflated indeed (rates can far exceed even those of New York! ), so with any of these hotels, you are always advised to book far in advance for better prices and selection due to their overall desirability for anyone visiting the city. This page was last edited on 21 December 2018, at 14:25.